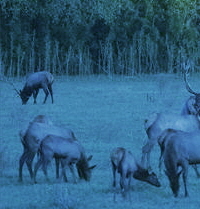 Wild elk and wild life of all kinds visit our ranch's fields and creek. 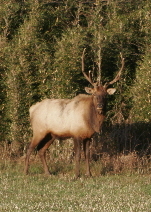 Elk, deer, bear, and wild turkey are just some of the wildlife of America tourists and photographers come here to see. 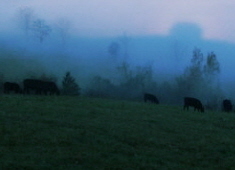 Our cattle ranch looks more like an elk ranch around dawn and dusk during Fall, Winter, and Spring. Arkansas even put up an "ELK CROSSING" sign on Highway 65 right by our rental cabins office! In the early morning light, it's hard to tell the cattle from the elk bulls and cows without a zoom lens. Most people think of Jasper and Ponca and the Boxley Valley for elk. And it's less crowded with tourists here! We have people stopped along the highway taking pictures for weeks in the Spring and Fall. When our guests step out on the porch, they can sometimes see the elk herd along the edges of our fields. "We had a great time! We saw the elk down along the edge of the woods EVERY morning and EVERY afternoon." This big bull kept hanging around in the open all Fall and Winter. Nobody told him elk are supposed to be shy. Usually the best American wildlife viewing times are only early, early in the morning and late in the afternoon. But this elk bull posed for pictures all day long. Watching elk, fishing in the creek, wildlife photography, nature walks, and four-wheeling are some of things families and church groups like to do here. CONTACT US to stay in our elk viewing cabins. For information about the Arkansas reintroduction of a native elk population, visit the AR Game and Fish Commission's website. Besides all the seasons and regulations for hunting elk, you'll find info on how they monitor the elk's health and progress with the help of the National Forest Service. You can also visit the Ponca Elk Education Center. Ponca is just an hour scenic drive from our cabins.